A 24″ deep solid roofed porch, shown here with incurved, wirework sides. The wirework sides have secondary inner frames at the front edges for added aesthetic and structural integrity. An ideal design to frame a town or country house doorway. Our solid steel Scoop porch is hot dip zinc galvanized before painting matt Black or Grey, or can be Aged to achieve a mellow zinc patina that looks like a lead roof. We can reduce the standard 20” porch roof height to 12.5” if there is restricted height above your doorway, and modify the height of the sides. The porch roof projects 24” from the wall and has a front lip to guide rainwater sideways. We didn’t want a tiled timber porch or a double glazed one, so when we found Garden Requisites, we knew that this porch was the perfect design for us. Width – Measure the width of the doorway from wall to wall. We would recommend a minimum overhang of 4”/10cms beyond both sides of the doorway. Porch Height – Measure from ground level (where the porch sides will sit) to the top of the doorway (underside of the lintel). This will tell us what height the porch sides need to be. If in doubt, call us as we will always advise and confirm porch dimensions prior to order. For more detailed advice, please get in touch. Each porch is made in three sections: the roof and two side supports. Porches are made to order in our workshops and are despatched for re-assembly on site. The sides should be fixed to the porch roof prior to offering the porch against the façade for marking out and fixing. The porch roof top rail has several pre-drilled holes for receiving the hexagonal head coachscrews (supplied). The base of each side support can be adapted to suit the ground surface. We’re happy to discuss specific design details and dimensions with you prior to placing your order. We can arrange delivery throughout the United Kingdom. We use an independent courier that offer next day delivery. 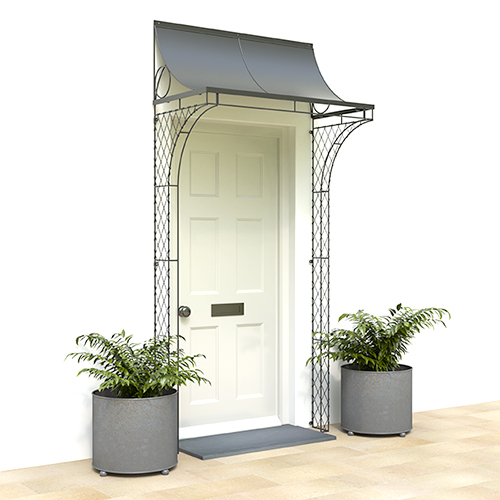 Porches are from £49.50, the price will depend on the number of items and weight of your order; we’re happy to provide a quotation prior to placing your order. Once ready, we will contact you to arrange a convenient date for delivery.